Organically Grown Liquid Teas from The Wuyi Mountains of China Brought to you by Asian Sun Teas. Tear the corner of the tea pack. Empty the liquid tea into 10 - 16 oz of Cold or Hot water. Your Asian Sun Tea is ready to drink. No steeping required. Enjoy our unique, great tasting, USDA certified organically grown, processed, and packaged condensed Asian Sun liquid teas. Our green teas and oolong teas are naturally flavored for your drinking pleasure and can be part of a healthy lifestyle that focuses on weight management, cholesterol control, blood sugar management, and many other health benefits from drinking green tea. Because Asian Sun Tea is a liquid, produced in our proprietary process, it requires no steeping. 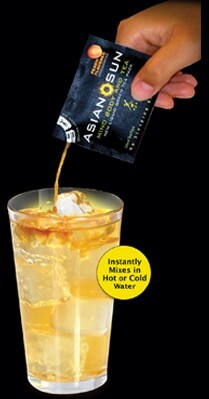 Just pour a convenient packet into 10-16 ounces of water, and enjoy it immediately, hot or cold.